Intertops Poker may not be the oldest poker room out there as they were established in 1996. However, since then they have climbed the ranks to one of the most popular. This can be attributed to their generous promotions and their fairly aggressive advertising. After a surprise June 2012 decision, Intertops has closed its doors to US players and this has definitely had a slight effect on its traffic numbers. Luckily, the other poker sites on the Revolution Poker Network (such as Lock Poker) are still accepting US players. While Intertops might not be the biggest poker room, they still have plenty to offer new players. They have over half a million registered players worldwide and can easily see 10,000 players online at peak hours. Even off-peak, there is a good selection of tables and Sit'n'Go tournaments for players, especially at the Hold'em and Omaha tables. As part of the Revolution Network, their traffic is comprised of all kinds of players, playing on a variety of premium poker sites. Like many other poker rooms that also offer non-poker options, the quality of the competition generally suffers. Many players come over from the sportsbook or casino connected to the Revolution network, and are (at best) casual players. This means there are quite a few soft tables and at the lower level stakes you can find quite a lot of fish. Forserious poker players, the competition at Intertops Poker may very well seem soft, no matter what stake level or tournaments you try. Intertops Poker has upgraded their software, allowing it to have a very modern, sophisticated feel. This does not diminish its ease of use, however. Intertops software is easy to install, with more than a few personalization options. Players can completely customize their tables, and save their preferences. There are great search and statistics features, and the ability to multi-table up to 6 tables smoothly and easily. Players can filter out unwanted tournaments completely or, on the other hand, set up reminders so they don't forget the tournaments they want to play. 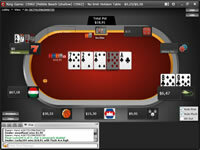 The Intertops Poker software is fast and smooth, and finding the type of table you prefer is simple and easy. What else could you ask for? Intertops Poker current deposit bonus is not the most generous offer, but they are very easy to unlock. They pay out in $5 increments, and earning the points is easy with 1 FPP (frequent player point) for every dollar spent on real money games and 7 FPPs for every dollar in tournament stake costs. However, Intertops has a fairly complicated bonus structure that requires players to earn points that they must convert into chips which can then be used to redeem for cash. There is also a card system which can be redeemed for tournament entries and can even be sold to other players. Regardless of the details, just know that as you play, Intertops Poker will be there to reward you! The best part of all, though, is that they don't just stop at their loyalty program. Intertops also hosts a number of freeroll tournaments, huge poker tournaments with multi-million dollar payouts, guaranteed weekly tournaments, and special events focused on frequent player points. Intertops Poker take security very seriously. Their new software wasn't only designed to look prettier, but to enhance a player's safety and ensure the security of their transactions while playing poker online. If players ever want to get in touch with Intertops customer service for any reason, they have the options to use snail mail, email, fax, telephone, and Skype. There are even regional toll free phone numbers and a live chat client built right into the website.